Six years since its launch in Ireland and some 10,000 sales later, the new Duster from Dacia has arrived and is a step up from the original. The hugely popular Duster has been given a makeover. 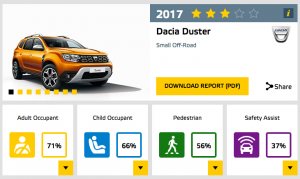 The cheap as chips SUV is similar in size to the original but Dacia has upped the quality and given the exterior a bang of a hammer. Every exterior panel on the five seat SUV is new and there are smarter looking light clusters too. 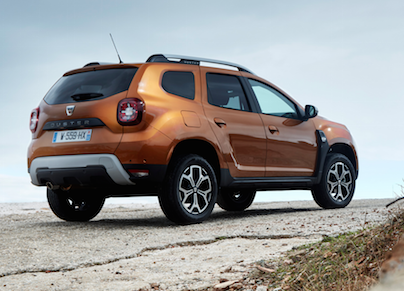 Launched when times were hard the smart looking Duster has delivered on Dacia’s catch phrase of being “Shockingly Affordable”. 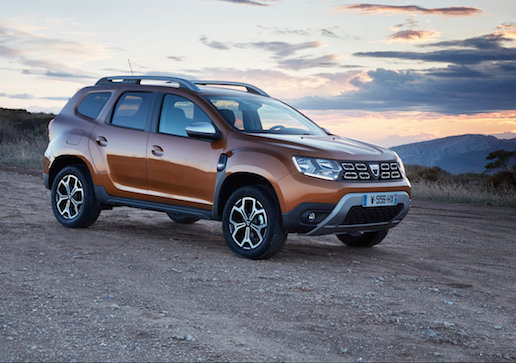 The Duster has grown a large and loyal following and it is no surprise to see the Duster dominate its class. Built using parent Renault’s parts bin the Duster is cost effective to build, as are all Dacias. The sub €18K price point is key for buyers who gain entry in to the fashionable world of SUV motoring for a few grand less than most rivals. The former Romanian State owned firm has built its reputation on offering bang of your buck. 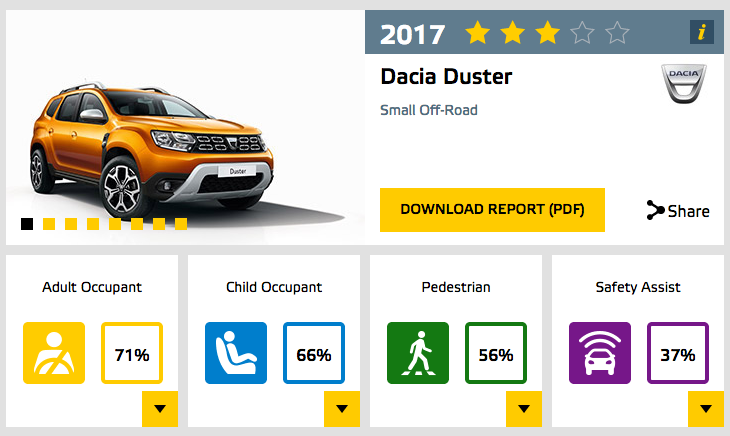 With the Duster you get a lot of metal for your money but there is the downside as no Dacia performs well in crash tests. Euro NCAP’s crash testing quickly reveals where money has been saved, in construction. No driver sets out on a journey to crash but often collisions happen and while most drivers will never have a serious collision it nice to know the vehicle your in is going to do its best to protect its occupants and other road users. 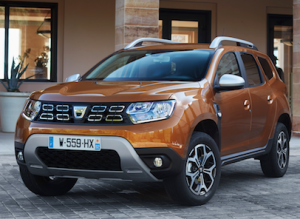 While the Duster looks tough and rugged it is one of the worst performers in NCAP testing and this fact should considered when buying. 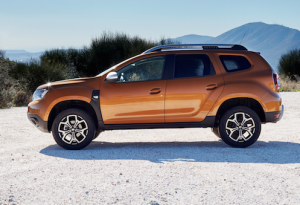 Outside, the Duster looks very familiar and more rugged than all its rivals, but look closer and you’ll see subtle changes like a new grille, LED running lights and new front and tail light clusters that add more bling to its appearance. The interior gets freshened up too and is an acceptable budget offering. The hard plastic dashboard is less offensive than before and allows curious hands stray a little further before encountering sharps edges and poor finish. The seats are softer, better built and reasonably comfortable unlike the early cars. The cabin is quieter too thanks to better use sound deadening materials. The boot size is unchanged at 445 litres or 376 litres in the all wheel drive version. 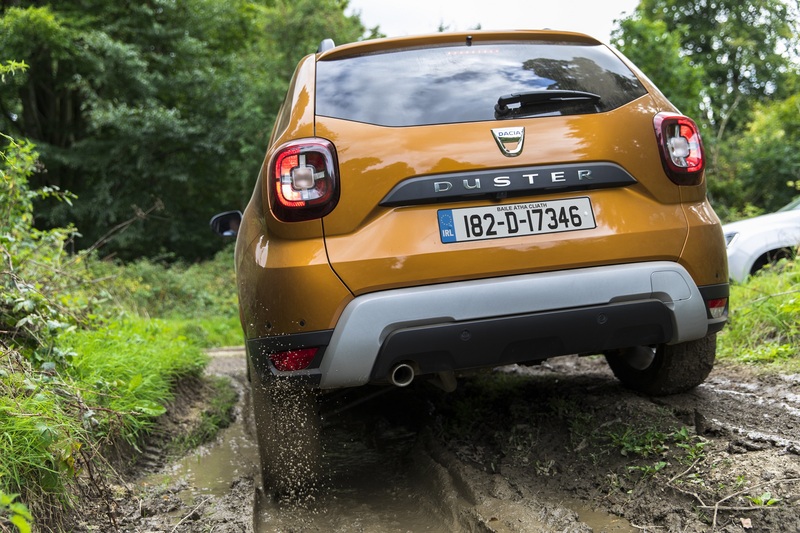 The big news with the second generation Duster is the availability for the first time in Ireland with a 115hp SCe petrol engine alongside the revised 115hp dCi diesel. This size of SUV is seeing a big swing away from diesel and this unit will keep Dacia at the races. Later in 2019 we will see more powerful petrol engine options arrive – some are even shared by Renault with Mercedes-Benz – now there is a posh connection! Front wheel drive is standard with the four wheel drive available on level two Dusters. New electric power steering is lighter and more responsive than the original’s. My diesel test car delivers lots of urge and is quick enough to point out the frailties in the Dusters soft riding chassis. On twisty routes body roll will temper your pace. The suspension handles rough roads well and is soft and comfortable. The Duster comes in three grades starting with Essential, Comfort and Prestige that tops the range. My test car was the top grade and featured keyless entry, Sat Nav and start/stop. Strangely it featured a traditional key slot on the passenger’s door (it was on the drivers side in the original) in case of the need to access the car should the battery fail in the card-like Renault-esq fob. 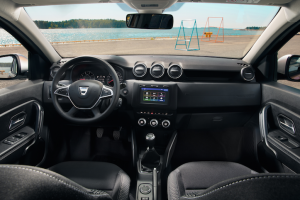 The Prestige grade throws everything at the Duster including parking cameras – the only thing missing for a premium experience were electric heated seats. There were a few niggles like the overly noisy fuel pump humming from the rear of the cabin and the poorly positioned pedals, especially the clutch that also featured an annoying high foot angle when operating it – and my clutch leg had no place to rest comfortably without leaning against the hard plastic centre console. Relatively minor issues but issues none the less. Every time I felt like complaining more I just reminded myself to factor in the low price and then I really had no issues at all! With Dacia and the Duster its all about price, starting from just €17,390. In my opinion the best value is in the comfort grade and I wouldn’t spend any more for AWD or Prestige versions. The car massively undercuts the competition and looks just as good as any of them in the flesh, just remember not to crash it.